Sutherland occupies much of the far north of Scotland. 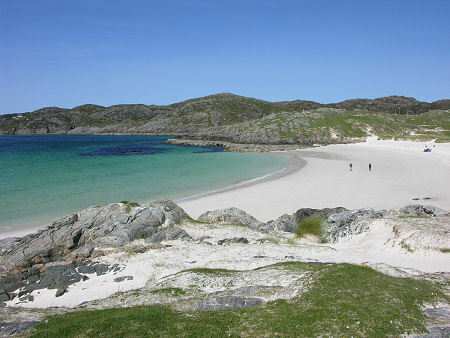 It has three coasts, which extend from Strathy and Tongue to Durness and Cape Wrath in the north; from Cape Wrath to Lochinver in the west; and from Helmsdale to Dornoch in the east. The only significant inland settlement is Lairg. For accommodation in Sutherland and a full list of features, see our Caithness & Sutherland area pages. Sutherland is bordered on its north east by Caithness, and on its south by Ross & Cromarty. It may seem odd to have some of the most northerly parts of the country called "Sutherland". The name reflects the rather different world view of the Norse, who controlled northern Scotland for significant periods of time. For them, this was a land which lay to the south of Caithness, and so became known as Suorland. The name was eventually anglicised as Sutherland. The native Gaelic speakers who lived here for centuries until many were removed during the Highland Clearances knew north west Sutherland as Dùthaich 'Ic Aoidh or the "Homeland of Clan Mackay"; western Sutherland as Asainte or "Assynt"; and eastern Sutherland as Cataibh. Cataibh is also sometimes used in Gaelic to signify the whole of Sutherland, and like the name of Caithness, probably looks back to the presence in the area of the Pictish Kingdom of Cait. Later, Sutherland became one of the 34 traditional counties of Scotland. The country town was Sutherland's only burgh, Dornoch. The reorganisation that reduced the number of counties from 34 to 33 in 1890 left Sutherland unchanged, with the result that Sutherland remained a county in its own right until reorganisation in 1975 swept all the counties away in favour of 12 regions. The regions formed in 1975 were the upper tier of a two tier local authority system. Most were divided into a number of district council areas, and Sutherland became one of eight district councils that delivered a range of local level services within the wider area of the newly formed Highland Region. When regions and districts disappeared from the scene in the 1996 reorganisation, Sutherland became part of the unitary council area of Highland. Initially Highland Council divided its coverage into eight management areas that were based on the eight districts, and Sutherland formed one of them. Since 2007, Highland Council has divided up its area rather differently into three operational areas. For the council's purposes, Sutherland now forms a part of the "Caithness, Sutherland and Easter Ross" operational area.